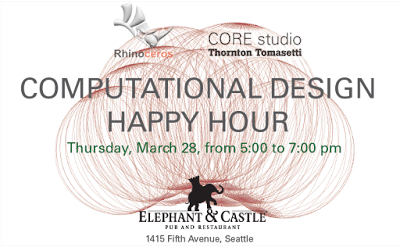 CORE studio at Thornton Tomasetti, Robert McNeel & Associates, and the Seattle Dynamo User Group invite you to join us at a gathering for computational designers. Thornton Tomasetti’s New York-based CORE studio team is visiting Seattle to host AEC Tech 2019 | Seattle. We’re taking the opportunity to get together with computational designers from the Seattle area to talk about emerging tech tools and current developments in architecture and engineering. Feel free to invite interested colleagues. See you there! Posted Mar 25, 2019 by Mary Fugier on Rhino News, etc.